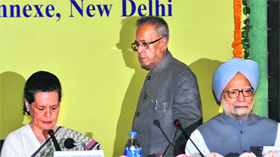 With members of the Congress Working Committee expressing concern over rising inflation, especially the latest hike in petrol prices, both Prime Minister Manmohan Singh and Finance Minister Pranab Mukherjee today admitted that the country is going through testing times but assured a worried party that the economic situation can be retrieved. All 60 lakh ration cardholders in Punjab will have smart cards for the purchase of essential commodities from fair price shops within six months. An exercise that aims at end-to-end computerisation of the public distribution system in the state has already been started. The ways of God are mysterious but Sachin Tendulkar, the man turned into god by cricket�s fans, is quite overt about what he wants to do in the Rajya Sabha. After being sworn in as an MP, Tendulkar said while cricket comes first, he has not taken his eye off the less fortunate, less popular �other sports�. The driver of the ill-fated Hampi Express, which collided with a stationary goods train on May 22 at Penukonda station under Bangalore division leading to death of 25 passengers, has admitted that he missed the home signal because his eyes were closed for more than usual duration. Monsoon may be a month away from the region, but people in the Northwest region can look forward to some respite from the soaring mercury in the next two weeks. The IMD today predicted that the long-awaited seasonal rains would hit the Kerala coast anytime in the next 48 hours.